I don't have time for this. The pile of papers to mark is too big but I just read Clarence's post about Gary Stager and I can't help asking: "Gary. 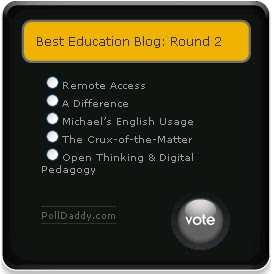 Are you reading edublogs or just talking about them? Have you seen any of this:"
Gary, what are you reading? On Tuesday I was invited to speak to Alec Couros' eCurriculum and Instruction class; EC&I 831. Alec is a great host. He has an easy comfortable manner and everything went off very smooth in eluminate. When Alec first asked me to give this talk, a few months back, we discussed what form the presentation might take. After a bit of brainstorming I decided to continue the meme Clarence Fisher started, continued by Doug Belshaw and Dean Shareski, in his K12 Online Keynote presentation. So, here is my riff on "A Day In The Life." The slides are below. Alec posted a summary of it on the course wiki and the full video and audio recording in Elluminate is available here ... I wonder if there's a way to capture the Eluminate recording in some sort of screencast format? This came as a bolt from the blue. I didn't even know about the awards until I received an email from Lani congratulating me on my nomination for Best Education Blog. (Thanks Lani!) I'm in some pretty august company in the education category. All nominees are entered in Round 1. After a week, voting takes place again in Round 2; the final round. The list of nominees is reduced to the top 5 and Round 2 voting determines the winner. 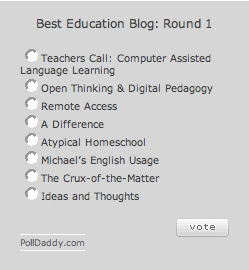 The finalists have been announced and I made the first cut in the Education Category. ;-) Thanks to everyone who voted for me and congratulations to the other finalists which include my friends Clarence and Alec. On to Round 2. The competition looks to be stiff. ;-) Voting is here. A paradigm of instructional design that suggests we create learning experiences for our students where they create content that educates. I had a conversation with a couple of friends who teach at university. We were talking about how much variation there is not only in the nature of assessment in different classes but also what work merits an A (the highest grade) or an F (failure). 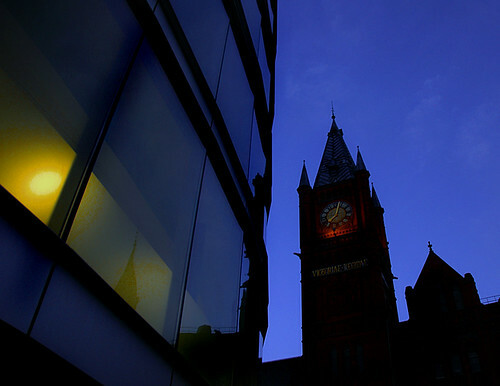 Some professors consider a mark of 85% an A, some require more others less. Some determine students entire grades from a single exam or paper; others require several short papers, a mid-term, final exam, and a major research paper. And these variations can occur when different instructors teach the same course and students receive the same credit (or not) for different work. We're no better at the K-12 level. I once attended a workshop where 30+ math teachers graded the same set of three problems. Each teacher decided how many marks each question would be worth and converted the marks to a percentage. Scores varied from percentages in the 30's to the 80's. I guess this is academe's dirty little secret: there are no assessment standards. To its credit the National Council for Teachers of Mathematics (NCTM) published a set of Principles and Standards for School Mathematics in 1995 (updated in 2000). The document includes The Assessment Principle. These are guidelines only. Not all math teachers are members of the NCTM, not all math teachers are aware of these standards, and adherence to the standards is voluntary not compulsory. One of my friends shared that she is required to ensure her classes achieve a predetermined average grade. I think that's unethical. Sometimes you get a strong group of students, sometimes a weaker group, more often it's somewhere in between. There really is no way to "predetermine" a class average. We all agreed it should be possible for a class to all achieve A grades or F grades. I don't believe a student's grade in any course is a measure of their intelligence. I do believe it is a measure of the time, energy, and effort invested in the class. But I digress, that's another issue. As we talked some more about assessment and pedagogy the conversation got a little more intense as I challenged my friends by saying: "If all you do is lecture do your students really need you? Couldn't they just read your assigned text, show up on test days, write the final exam and be done with it?" That started us on a bit of a heated discussion about instructional design and assessment. 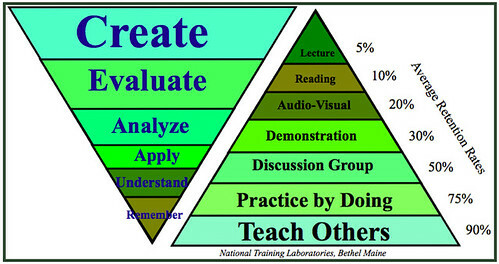 What became really clear to me is that most instructors in university teach and assess their students at the bottom of Bloom's Hierarchy. At one point, one of my friends said: "Look, we're not going to throw out hundreds of years of tradition because of what we think sitting here discussing this." "That's not a fair criticism. It's not like there isn't scads of research in teaching and learning that I can point to supporting what I'm saying. I'm not making this up as I go along. 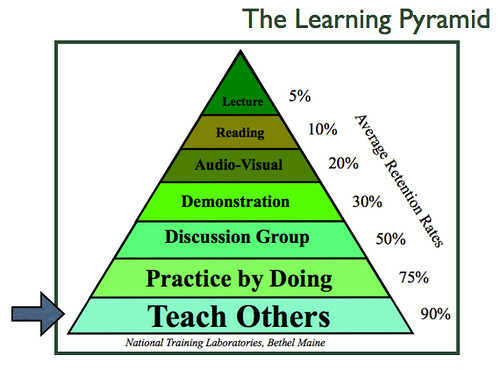 The fact is, if you just lecture to your students, on average they're going to retain maybe 5% of what you say. You can do a lot better to make their learning sticky." 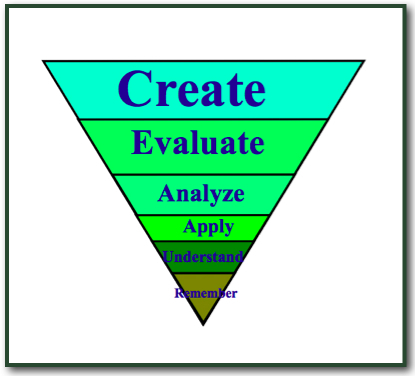 "If you really want to ramp up your teaching have your students create content that educates. That will naturally engage them at a higher cognitive level." "You can require your students to demonstrate their understanding of what they are learning by having them apply their knowledge analyzing and evaluating relevant novel situations or problems. 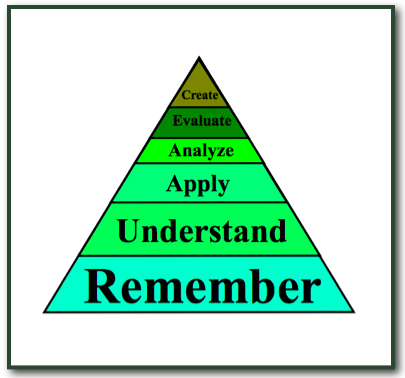 Better yet, get them to create content that educates an interested learner and they will automatically incorporate all those levels of engagement while they make their learning sticky. I don't need to tell you that there's nothing like having to teach a thing to make you really learn it.